I have been birding since…umm…well I can't remember because I was too young. I do not remember getting my first pair of binoculars or my first birding trip with my dad. It was my father that got me into birding at an early age. I have been birding for over 50 years and have birded in all 50 states and much of Canada. And I have always been smitten by the birding bug. I love to get outside and go find birds. Every trip out is an adventure! In 1998 I zigzagged across the continent–traveling 130,000 miles while trying to hold down a full time job at a nuclear power plant–to try to see as many species of birds in one calendar year as possible. It was an incredible experience passing the 700-species mark—an achievement many birders aspire to in a lifetime. But there was competition. Two other birders, Sandy Komito and Al Levantin also did Big Years the same year as me and also broke the 700-mark. Our competitive quests are documented in the 2004 non fiction book, The Big Year, by Pulitzer Prize winning author Mark Obmascik. And unbelievably, Twentieth Century Fox made a full feature motion picture inspired by the book! It has A-list actors Jack Black, Steve Martin, and Owen Wilson and a really strong support cast. It was produced by Ben Stiller and directed by David Frankel (who also did Marley & Me and The Devil Wears Prada). Worldwide release date was October 14, 2011. It is available now on both DVD & Blu-ray as of January 31, 2012 and became available on both Netflix & Redbox on February 28, 2012. I had the fortunate opportunity to be the Bird Consultant for the movie, The Big year. It was filmed in spring & summer of 2010. I was on the set for 3 weeks with many of the actors and crew and got a chance to meet the stars, Jack Black, Steve Martin, and Owen Wilson. It was truly a treat to watch the movie being made and to have a part in the creation of a story for the silver screen. 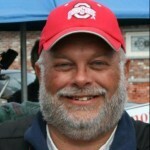 I currently live in Sugarcreek in the heart of Amish Country in Northeast Ohio. Other than following St. Francis's love of birds, I have always been intrigued by them. After my 21 years of naval service, I got to settle down. Around 1993 I was given a gift of a birding class with the Smithsonian Institute. After moving back to Florida, I got involved with Florida Birding and Photo Fest. That was eye-opening. Birding and photography both in one place, what a deal. Wanting to learn more about what is around us; I enrolled in the Florida Master Naturalist courses. That opened another world. I came to Flagler Audubon in 2013. This is where birding has exploded for me. I have been learning about new birds almost every day. It is exciting to find that new life bird. I am up to 178. My family moved to Tampa from the Detroit area in 1972. We lived close to the bay and I would spend my time after school along the shoreline, birding and exploring. My parents gave me my first Audubon bird book that year. It's been a lifelong love affair. I've birded everywhere I've traveled; throughout the United States, Japan and the Philippines. My favorite place to bird is the Black Point Wildlife Drive at the Merritt Island National Wildlife Refuge in Titusville. We see something interesting each time we visit. We have been members of the National Audubon Society for more than forty years and the local chapter (FAS) for over twenty years. Joe has held every officer position for the local chapter during that period of time, as well as being on the board of Florida Audubon Society in years past. We have conducted bird surveys for local, state and federal parks during the past twenty years including bird lists and biological lists for parks such as Princess Place Preserve and Washington Oaks State Park. Currently we still members of Eagle Watch (Florida Audubon) and have been monitoring an eagle pair at Princess Place for the past 18 years. We continue to conduct our Eagle forum at the PPP nest every Sunday morning from 10:00am to 2:00 pm during the nesting season. In the past we have monitored all active eagle nests in Flagler County. Additionally, we have conducted and held number birding classes throughout the county for fraternal organizations and the County school District as well as private conservation and environmental organizations. David Simpson was born and raised in Brevard County Florida. With mentors like Helen Cruickshank and Johnnie Johnson and over 35 years in the field, it's no wonder that he has become one of Florida's premier birders. He has been birding for over 25 years starting as a teenager leading field trips for his local Audubon chapter. He also has over 25 years of experience leading tours, both through his previous job as a ranger at the St. Sebastian Buffer Preserve, as well as at festivals including the Space Coast Birding and Wildlife Festival and the Florida Birding festival. In addition to birds, he is familiar with all aspects of Florida wildlife and has an extensive knowledge of native plants, snakes, frogs, and many other critters you encounter in Florida. David is the current holder of many American Birding Association (ABA) records, including Big Year (both first and second place for Florida) and Big Day (current holder of 10 monthly records in Florida). He is also well known for documenting and sharing big day adventures on his blog. David is without a doubt the most fanatical lister in Florida. The records are a testament to David's unrelenting tenacity, and illustrate his vast experience throughout the state. They also qualify his wife Dee for sainthood! 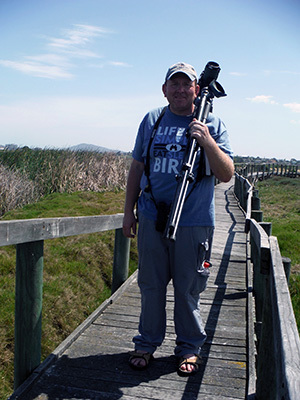 David loves writing about his birding exploits almost as much as accomplishing them. Dee is a long time member of Space Coast Audubon where she has been newsletter editor and program director. She is also a graduate of the Florida Master Naturalist program. Despite those facts, she remains a terrible, terrible birder but enjoys sharing her mistakes with others in presentations and on her website, deefairbanks.net. I am a Recreation Coordinator for Lake County Office of Parks & Trails. I began birding in 8th grade at Hawk Mountain Sanctuary in PA. I have been hawk counter at Bake Oven Knob and Montclair Hawkwatches, did banding and radio telemetry on Endangered Florida Grasshopper Sparrows, eBird Reviewer for Lake and Sumter Counties, eBird Hotspot Reviewer for Florida, was Lake County BBA coordinator for Florida Breeding Bird atlas 2011-2016, I have seen 431 species in Florida, have done two (2) Big Years, Florida 2008 with 359 species, and Lake County 2015 243 species. I also lead trips to the Dry Tortugas for Florida Nature Tours www.floridanaturetours.net and Rebecca Smith and I have started Archeopteryx Birding and Nature Tours https://archeopteryxbirdingandnaturetours.wordpress.com/. David's birding epiphany came in 1973 when he saw a small bird dispatch and consume an even smaller bird in order to feed its nestlings. The bird on the menu was a House Sparrow & the other bird was a Loggerhead Shrike. In 1986 he became a volunteer with the Florida Breeding Bird Atlas Project, and during the next 6 years spent vast amounts of time in the field with some of the most experienced birders in Florida. This activity was the impetus for what could now rightly be called an obsession to observe birds whenever possible. In 1994 he became the Volusia County Compiler for the North American Migration Count, and has served in that capacity to the present. In 1996 he reestablished the Daytona Beach Christmas Bird Count and continues as it's compiler. Since 1987 he's been the Conservation Chair for Halifax River Audubon in Daytona Beach. After serving 4 years as President, he recently assumed the duties of newsletter editor. He has led many field trips for Audubon, The Nature Conservancy, the Space Coast Birding & Wildlife Festival and other groups.